Practical Software Design is the trading name of software developer Jon Bird based in Cardiff, Wales. Ease of use - everything to hand, nothing in the way. Planning - Dreaming up plots and characters. Interactions and events. Constructing - This is the actual writing bit. The free flow of words, putting one sentence after the next. Editing - Reviewing and changing, moving stuff around, adding and removing. This is editing by the author, not to be confused with a separate "editor". Every author obviously works in a different way, spending more time on one activity than another. But in general, all authors spend at least some time on all of them. 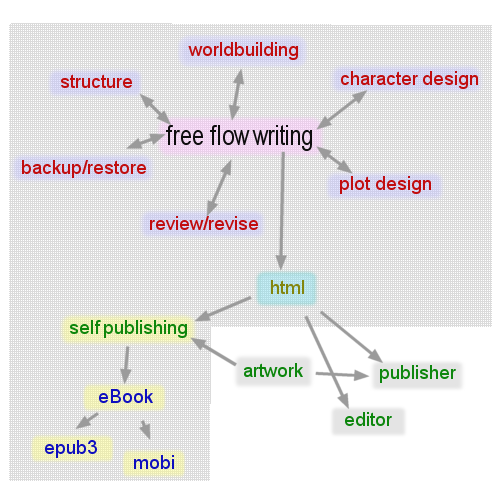 Our software is designed to help writers in all three areas. By help, I mean to make things easier and quicker whilst distracting as little as possible. Software cannot actually write the words, but it can organise, automate where possible and secure your work. All with the intention of enabling authors to spend their time constructing. A writing app is a very personal thing. All products are available on a trial basis to see if they are right for your style of working.